Ralph Lauren Polo Red is the ultimate in design, power, and distinction. Ralph Lauren Polo Red 125ml. 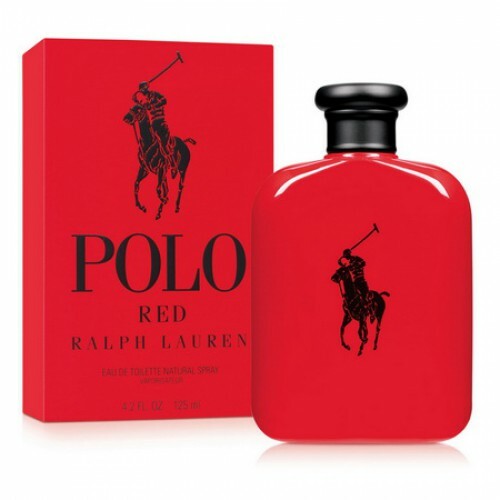 EDT - Fashion house Ralph Lauren introduces a new perfume for men Polo Red, part of the collection of Polo. Rich, red flavor emphasizes pronounced energy and strength of wood-burning spicy notes. Perfume offers head notes of red grapefruit in a duet with cranberries. Next comes into force freshness of Italian lemon. Bright red heart consists of a combination of notes of red sage, saffron and lavender. Flex your chords mahogany, amber, coffee beans creates energy harmony of flavor. Songwriter known perfumer Olivier Gillotin, expressed in flavor Polo Red main theses collection «Polo» - dynamic, energetic mood, but at the same restraint and aristocracy. Fragrant novelty for men, able to combine leisure and work. This fragrance belongs to the exquisite woody spicy fragrance family, among its top notes we find grapefruit, lemon and blueberry Italy while captivates us with heart notes with hints of saffron and sage, as well as amber and coffee. Polo Ralph Lauren Red, It is noteworthy that for some guys, this fragrance is best used in times of autumn winter, however it is very versatile and even in spring can be used. 2013 men's fragrance. format in the toilet water, flanker fragrance Polo and followed him blue and black options. Now it's time for red. Perfume opens fiery blend of spicy red saffron, fresh red grapefruit and deep mahogany wood, which kindles in every person adventurous streak thrill seeker. Polo Red Ralph Lauren - forward and try! Maybe I should buy, try and make yourself think? Note: cranberry, lemon, red salvia, lavender, amber, cedar, grapefruit, mahogany, coffee.